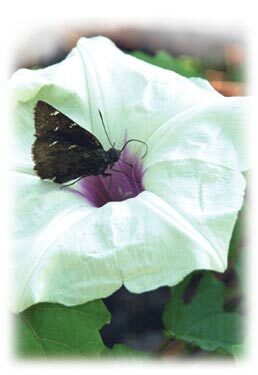 A skipper butterfly, one of some 50 species of skippers in South Carolina, rests on a morning glory (Ipomoea pandurata), a common vine also known as man-of-the-earth, or man-root. Morning glories, actually relatives of the sweet potato (Ipomoea batatas), often inhabit disturbed roadsides and fence rows; this one was photographed near the Savannah River Site’s Williston Barricade. In the background are leaves of the native South Carolina grape (Vitis rotundifolia) that gave rise to the state’s domesticated muscadines (purple-to-black-fruited) and scuppernongs (amber-to-green-fruited). The photograph for the 2002 report’s cover was taken by Al Mamatey of the Westinghouse Savannah River Company’s Environmental Services Section. The cover was designed by Eleanor Justice of the company’s Documentation and Information Services Section - Documentation and Information Development Group.